The Google Pixel 4 may not be the only new smartphone that the search giant is working on. A new patent application from the company details a modular device that blurs the lines between the old Project Ara modular smartphone design and a simpler approach like Motorola's Moto Z phones with Moto Mods or the modular LG G5. The patent was spotted by T3. This new patent shows a device that doesn't have quite the same level of granular customization that the Project Ara smartphone was aiming to offer. But, it still shows a design that offers far more variety than the Moto Z family of smartphones. 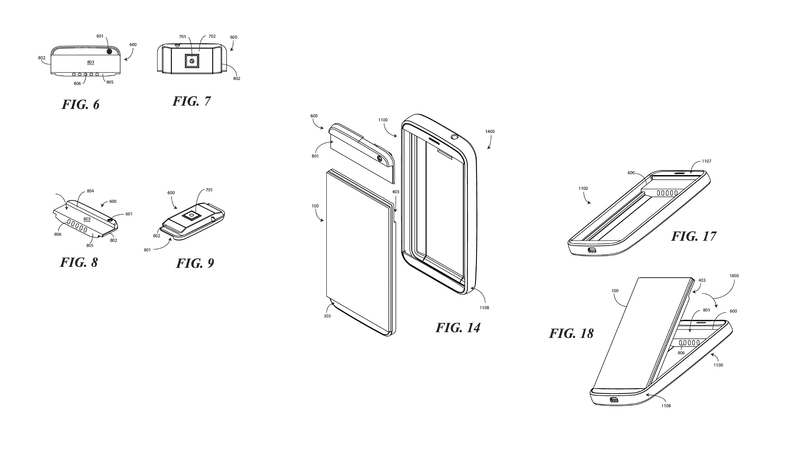 Patent images show of a number of modules that can slot together to make a complete handset. We see a main housing module that allows two other modules to slot in. The patent describes users' ability to "customize and modify the device by attaching different electronic accessory modules to the electronic device to create new and changing devices with unique features. Additionally, different housings can be used with the electronic device to create customized device experiences." This opens the possibility of a device that can have its display, sensors, system on a chip, chassis, and camera all swapped in and out. The patent describes a module that could include anything from extra scanners, auxiliary battery or memory, an extra display, or different types of cameras. The patent also doesn't limit itself to the smartphone form factor. This degree of modularity for a device has the benefit of allowing customers to kit the product to their needs while also switching components as they become outdated, malfunction, or are simply unneeded on any given day. The implications for e-waste are also positive, as consumers would no longer dispose of whole device when upgrading. Of course, as we've seen Project Ara gather dust over the years, it's just as possible that this patent will never lead to a new device from Google. And, while we could hope for the Google Pixel 4 or some new smartphone line to get this functionality, we'll just have to wait and see.